Peacock or "Rainbow" Spikemoss. 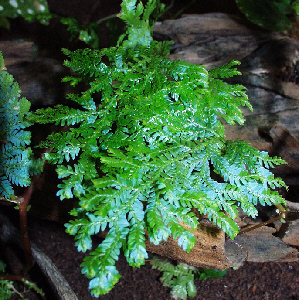 Selaginella or "spikemoss" does extremely well in woodland and tropical terrariums due to their cultural needs. This plant gets its name from the fact that its blue-green foliage is iridescent. Easy to grow, they like shady, moist conditions and will quickly spread to offer a beautiful ground cover. Note: The color of the fronds are variable and can vary considerably as a result of the time of year and its current growing conditions. 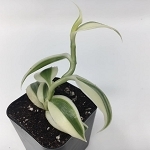 Coloration can be from bright green to blue-green to a dull coppery color but can revert once again when grown under your particular growing conditions.